Teach Me To Listen and Obey 1 and 2 are NOW Available! I’m so excited to FINALLY get to offer this DVD series for helping young children learn to understand language. By the time we were done filming, there was so much information that we decided to split it into a 2 part series so that we could address specific developmental phases and disciplinary approaches for both toddlers and preschoolers. Part 1 focuses on teaching younger toddlers ages 1 to 2, and part 2 is for parents of older toddlers and young preschoolers ages 2 to 4. Both DVDs focus on helping parents and professionals teach receptive language skills, or improving the way a child understands and comprehends language. A child must understand words before we expect him to talk, and certainly before we expect him to obey. Many parents and teachers label a young child as “difficult” or as a behavior problem when the real problem is he or she doesn’t understand and process language as well as other children his age. This is always true for kids with developmental delays and other diagnoses such as autism spectrum disorder, sensory processing disorder, Down Syndrome, cerebral palsy, or prematurity. Because of these delays, all of these children have difficulty understanding what’s expected of them. Many times late talking is also due to underlying difficulty with receptive language. A child must understand words before he begins to use those words to communicate. It’s hard to discipline ANY toddler, but when you’re considering your options for a toddler with developmental delays, it’s especially challenging. Both DVDs explain appropriate disciplinary methods for parents of young children with problems learning to understand language, listen, and obey. The good news is that there are lots of very practical ways to work on these skills at home. Teach Me To Listen and Obey 1 and 2 show parents simple, but effective strategies for improving the way a child understands language and then can begin to obey. Even if you feel your child is older and past the “baby” stage, if he is not consistently following simple directions or paying attention when you talk to him, you need to begin here. In Teach Me To Listen and Obey 1, you’ll learn the definition of receptive language, be able to recognize the early signs and symptoms of a receptive language disorder, and review the basic receptive language milestones for toddlers and preschool children between 1 and 4. You’ll learn 3 different ways to cue your child and be able to use these techniques during play and during your daily routines at home to provide a strong foundation for comprehension and communication skills. CONSISTENTLY follows simple directions, enjoys playing with you, and pays attention when you are talking to him. If he can’t do all of these things yet, back and begin with Teach Me To Listen and Obey 1, even if your child is older. During Teach Me To Listen and Obey 2 you’ll see demonstrations of teaching children how to understand all of the major receptive language milestones for children ages 2 to 4. This includes learning to understand verbs, prepositions, adjectives, pronouns, and other concepts such as size, categories, and making inferences. You’ll also find out what’s NOT important to teach your child at this phase of language development so that you can use your time efficiently and wisely. I’ll show you my best “games” for teaching young children to listen and follow directions and give you ideas for involving siblings at home. We’ll also tackle discipline! 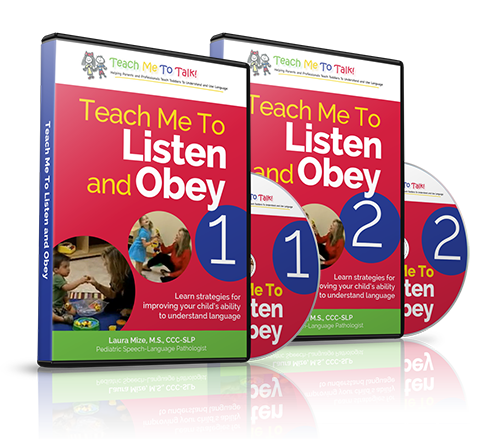 Teach Me To Listen and Obey 2 will help parents and professionals understand developmentally-appropriate disciplinary strategies for young children ages 2 to 4 who are struggling to learn language. First we’ll review the recommended techniques, and then you’ll see actual demonstrations of how to handle common behavior problems such as difficulty with transitions, throwing things, melt-downs and tantrums, difficulty paying attention and staying on task, or refusing to do what you’ve asked. ← Pointing and Grunting – Good Thing or Bad Thing? All of the presale discount codes have been sent out via e-mail to those of you who ordered Teach Me To Talk. 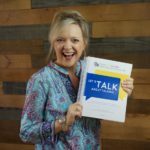 If you didn’t receive your offer yet, e-mail us at johnny@teachmetotalk.com, and we’ll send you a special code so that one DVD is $25.95 plus FREE first class shipping in the USA, and the 2 DVD set is $49.98 also with FREE first class shipping in the USA. This offer is just for previous Teach Me To Talk customers, and it won’t last long, so hurry! With the steep discounts we’re offering, we can’t do free international shipping. I also want to apologize if your in-box received more than one e-mail from us. We had some technical problems while getting those out. If you were inundated by teachmetotalk.com, sorry! For those of you who have e-mailed me that you still haven’t received your coupon code – Check your spam inbox in your e-mail account. I’ve received several “bounce back” e-mails even when I’ve tried to reply directly to your request because your spam filters are rejecting my e-mails since they are from teachmetotalk.com. Hi laura! I would like to order your dvds. can I still avail of the special discount offer? I’m not sure which to buy. If you can remember, I emailed you about my son who is 3 and 6 months old now. He was diagnosed by her developmental pediatrician to have mild speech delay and mild hyperactivity and inattentiveness. H e has been undergoing speech and OT since he was 2. we’ve seen him progress. He has some words but still we have difficulty communicating/conversing with him. He can follow simple commands like close the door, get your toys, turn off the lights, etc. But when we ask him about what he did in school, or what he watched, he can’t say anything. Do I still need the “Teach me to Talk” DVD?or just the “Teach me to Listen and Obey” DVD. 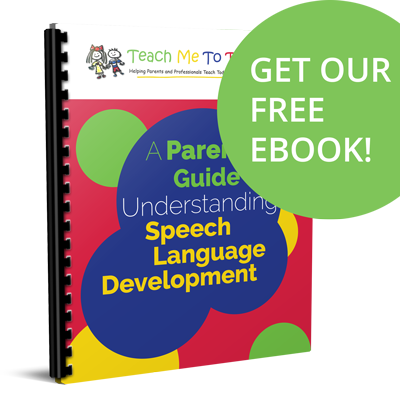 Teach Me To Talk targets expressive language and is appropriate for parents of children, regardless of their chronological age, who are non-verbal thru children who are using single words and need to learn to use short phrases. If he’s still at the single word level, there are techniques included to help you teach him bump up to phrases. Teach Me To Listen and Obey 1 targets early receptive language skills and is most appropriate for parents of children who don’t consistently interact or follow simple directions. It sounds like he’s doing this already. Teach Me To Listen and Obey 2 also targets receptive language skills, but for kids who are ready to move to two-step commands and who need help understanding lots of different kinds of words so that they can follow directions and understand conversation. Learning to answer questions is addressed throughout the DVD, especially in the latter-half of the DVD with in the sections on negation, categories, and inferences, but answering questions is not a “topic” per say in this DVD since I felt like it deserved more time than I could allocate on this project, so….. you guessed it, it’ll be a future DVD! I am not even going to begin to take a stab at when that will be available, but it’s on my list for 2009! I hope you’ve read the articles on answering questions too and are putting those strategies in place with him. Answering questions really is an expressive AND receptive language task, so it is more complicated for lots of children! I hope your SLP is giving you ideas too! Thanks Johnny! I have the shipping notice in my e-mail. 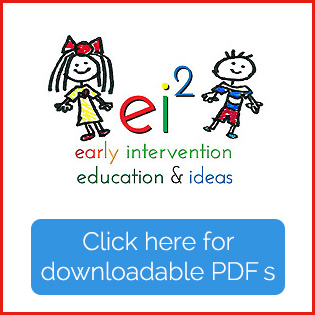 Excellent resources for parents, professionals, and students. The content and processes presented are very contemporary and appropriate for work with young children. Very nice work here; very enjoyable and educational.